“You’d be amazed at the difference that the type of light bulb used makes on your energy bill,” commented Shani Duncan, Head of Appliance Traders’ Energy Division (ATL). Duncan recommended consumers make the switch to LED bulbs to bring about immediate savings on future energy receipts. “LED bulbs use up to 89% less energy than standard incandescent bulbs and last up to 25 years so with cheaper running costs and fewer replacements, you’ll see energy savings straight away,” she said. Panasonic, one of the world’s leading ‘green’ electronics companies harnesses the use of LED technology, manufacturing a wide range of eco-friendly devices including the relatively inexpensive but effective bulbs. “Panasonic has the best LED bulbs on the market which are not only eco-friendly but also considerably affordable,” quipped Duncan. “They range from J$2500** upward which is remarkable for a bulb that you’ll only change twice in 50 years. The LED emits the same soft white light much like fluorescents but are more efficient, durable and have a long life span which makes them perfect for residential lighting”. The Energy division head urged consumers to undertake an energy assessment of their homes to develop tailored conservation methods, “Every step towards conservation impacts our financial bottom line so the time is right to make the energy switch.” And for those looking to cut back even further, Duncan advises that there are a plethora of options, from small steps such as switching to energy-efficient bulbs or going completely off the power grid by way of solar panels. “Consumers have the option of going off-grid becoming fully reliant on their own photovoltaic (PV) system or they can introduce a grid-tie system which utilizes both the PV’s and the national power grid,” she advised. 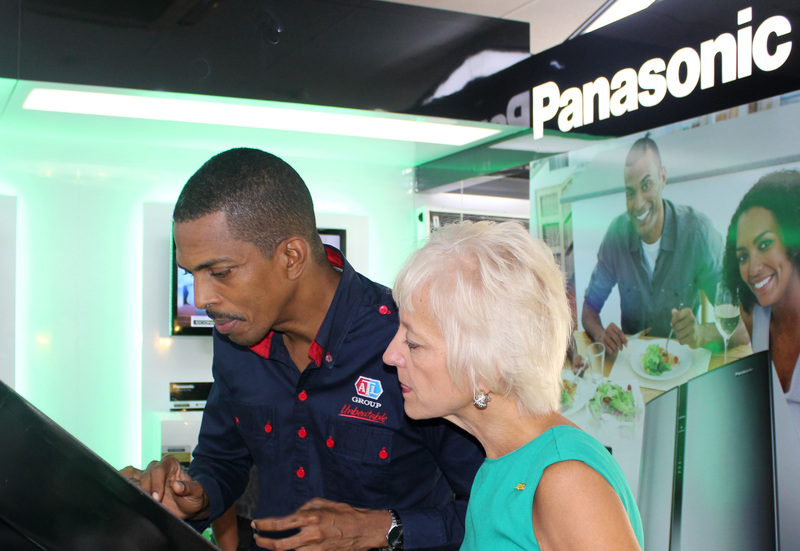 General Manager of Appliance Traders Limited (ATL) Ian Neita (right) demonstrates to Kelly Tomblin, head of the Jamaica Public Service Company (JPS) how to navigate the touchscreen Panasonic Eco-Simulator at the launch of ATL’s Eco Store in Kingston on Thursday June 6. The ATL Eco-Store is Jamaica’s first energy-exclusive retailer and will distribute a range of green electronics including inverter refrigerators and air-conditioners, solar panels as well as LED bulbs. 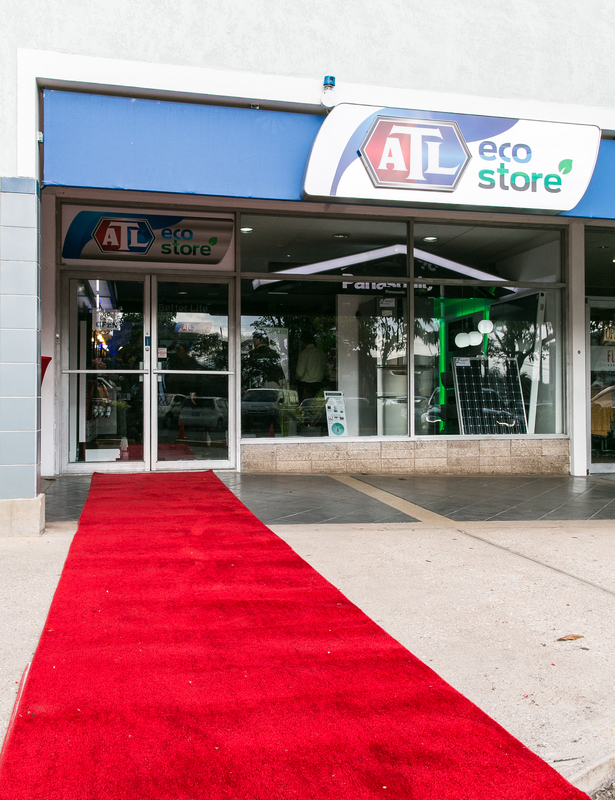 Business and engineering solutions retailer Appliance Traders Limited (ATL) has made another streamlined move into the energy space with the launch of its energy-exclusive retail outlet, the ATL Eco-Store. The first of its kind in Jamaica, ATL’s Eco-Store, located in the Manor Park Plaza in Kingston, marks the company’s continued expansion into the alternative energy space following the launch of its Energy Solutions division in April this year and the introduction of its own ‘Eco-Smart’ electronics-efficiency certification. Teaming up with long standing partner Panasonic as well as Israel’s top solar water heater provider Nimrod, the ATL Eco-Store boasts the latest ‘green’ technology from the Panasonic inverter product line including air conditioners and refrigerators, Panasonic HIT solar panels, televisions, LED and CFL lighting as well as Nimrod’s solar water heaters and other photovoltaic (PV) systems. The store will also carry a range of timers, energy monitors and power strips from the Jamaica Public Service Company (JPS) with whom ATL forged a strategic partnership in May to retail energy saving products. In addition to showcasing eco-electronics, the new ATL energy- exclusive outlet also boasts an interactive Panasonic Eco–Simulator which compares consumption patterns of energy saving appliances versus inefficient models to aid customers in learning about conservation and efficiency. The ATL Eco-Store, previously one of the company’s two Kingston outlets, will be open to the public Monday June 10 and will operate Monday – Friday 10:00 am – 6:00 pm and from 9:00 am – 1:00 pm on Saturdays. Appliance Traders Limited (ATL) announced Thursday that it will exclusively distribute solar water heaters from Israeli supplier, Nimrod Industries Limited. It forms part of ATL’s new thrust to offer energy-efficient solutions to Jamaican homes and businesses. “There has been a prominent call for homes and businesses to ‘go green’ with several local government agencies and financial institutions supporting ventures in alternative energy. With the Nimrod distribution, ATL is bringing the best of Israel’s solar technology to Jamaican shores,” said ATL’s Energy and Engineering Manager Paul Grey in the release. ATL said that the Nimrod product ideally captures natural light whilst protecting against rust which develops after exposure to ‘hard water’. “In the Caribbean, we are prone to ‘hard water’ – that is water with mineral elements. Nimrod coats their piping with enamel which prevents mineral deposit build-up and ultimately extends the life of the heater, ensuring savings for customers,” said Grey. “We are pleased that Nimrod has chosen to permeate the Jamaican market. We think the time is right and that Jamaicans are ready to invest,” Grey stated. ATL is owned by Gordon ‘Butch’ Stewart. Solar water heaters have grown in popularity since the 1990s, especially within resorts as a means of reducing electricity costs. ATL will be going up against companies such as longstanding player Isratech Jamaica, which also distributes solar heaters in partnership with an Israeli company, Chromagen. Isratech Jamaica has, since the 1990s, imported the finished water heaters for local sale but this month announced plans to start local production of heaters. It will import the components from Chromagen and assemble the heaters at its plant at Kendal in Mandeville once it finalises a J$15-million plant expansion. The terms of ATL’s deal with Nimrod were not disclosed, neither did ATL respond to requests for comment up to press time on the type of investment and infrastructure that will surround its new product line. #TuneIn to CVM TV for ‘Live @ 7’, TONIGHT Thursday October 11 at 7pm as host Elon Parkinson speaks to ATL’s Engineering Manager, Mr. Paul Grey on eco-efficient electronics as well as the use of 60 cycle appliances on the JPSCo’s 50 Cycle grid. 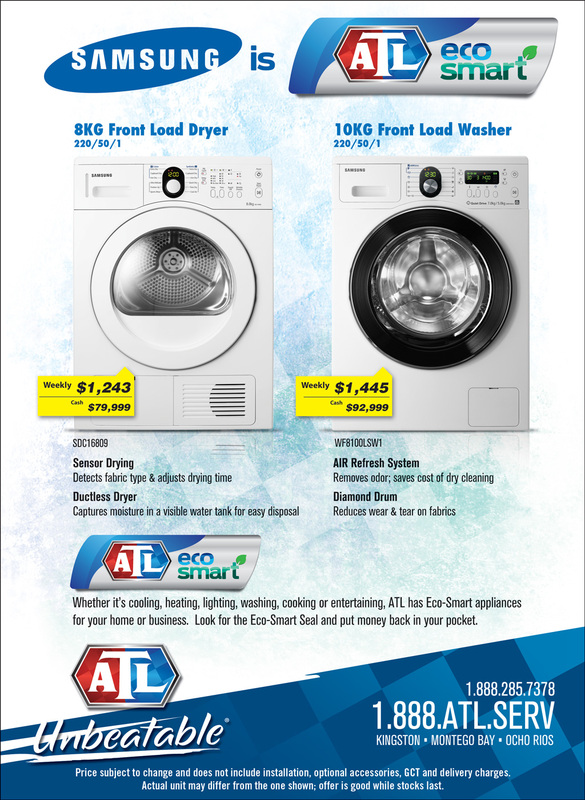 Go Green & Save Green with ATL EcoSmart Appliances. Whether it’s cooling, heating, lighting, washing, cooking or entertaining, ATL has Eco-Smart appliances for your home or business. Look for the Eco-Smart Seal and put money back in your pocket. Appliance Traders Limited (ATL) announced this week the launch of its Eco-Smart certification, a programme designed to earmark energy-efficient electronics in its product line-up. Much like the international trademark standard Energy-Star, the ATL Eco-Smart seal will be affixed to electronics and appliances that are proven to meet international standards in energy efficiency. “With energy costs on the rise many home-owners and businesses are going ‘green’ and are looking for eco-conscious appliances to reduce their energy bills as well as their environmental impact. With our new Eco-Smart seal our customers are assured that the product can save them as much as 60 percent of their energy costs without sacrificingperformance, features and comfort” said Paul Grey head of ATL’s Engineering and Energy Department. ATL has had a long history in delivering engineered solutions working with leading technology companies. Last year ATL leveraged its 32 year partnership with Panasonic to design and install an eco-village at Sandals Montego Bay. This project, which is the first of its kind in Jamaica, boasts an entirely self-sufficient solar power system to operate all its cooling, heating, lighting and entertainment systems. The project was established as a pilot to demonstrate the savings to be accrued from the implementation of alternate energy sources. The Eco-Smart Certification is the first of many initiatives that ATL will spearhead through its energy portfolio. “Eco-electronics has become a big part of our business and we are dedicated to delivering to our clients solutions that will impact their bottom line,” said Grey. To save energy when cooking with an oven, keep preheating to a minimum and make sure the oven door is fully closed so that heat does not escape. Do not use a full size oven for small cooking jobs, and do not use a pot or pan that is too large for the amount of food being cooked. Keep the oven and the stove-top clean for maximum efficiency. 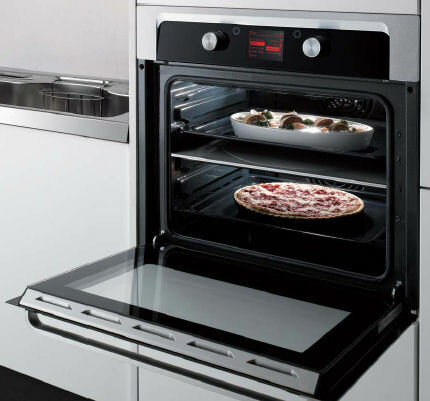 Gas ovens are more energy efficient than electric models, and self-cleaning models offer the best insulation.